Marketing is getting personal these days – very personal. 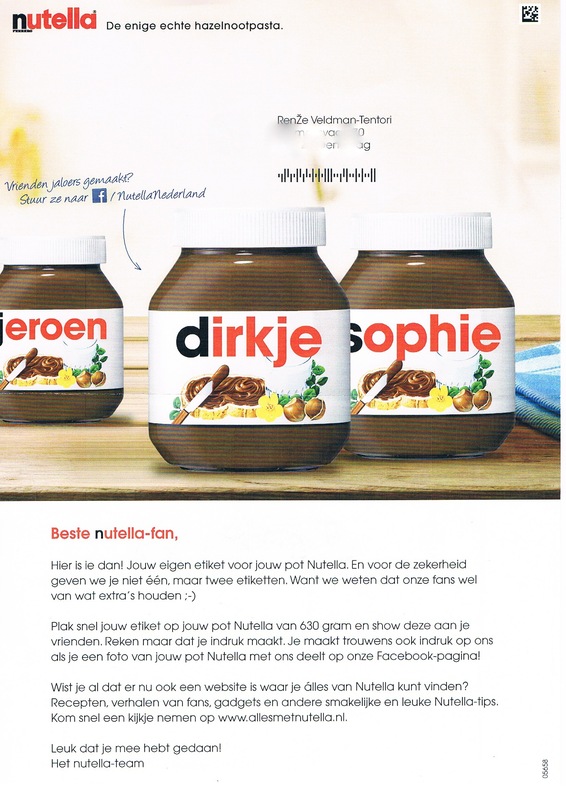 Nutella is currently running a Facebook campaign here in The Netherlands where you can request a personalised label for a Nutella jar with your own name. After you order via an embedded app on the Nutella Nederland Facebook Page you receive a letter and your label(s) in the post. Quickly stick your label on your 630g jar of Nutella and show this to your friends. Expect to make an impact. You will also make an impact on us if you share a photo of your pot on our Facebook page! Did you know that there is now a website where you can find out everything about Nutella? Recipes, stories from our fans, gadgets and other tasty Nutella tips. Come quickly and look at http://www.allesmetnutella.nl (everything with nutella). Great that you took part! Who doesn’t love seeing their own name on something. Who doesn’t love free stuff? They also aim to exceed expectations – you order 1 label and receive 2. Sure, Coke have already done something similar with names on Coke cans but this time you get to actually custom order your name. They specifically ask you to share – both with friends and with the company. Nutella is an international brand and this campaign may well run in other places in the world (is it available where you are?) but this one is specific to The Netherlands, written in Dutch. The names in the examples are very traditional Dutch names: Jeroen, Dirkje and Sophie. The end of the website asks you to visit www.allesmetnutella.nl to continue the relationship. So will they make more sales with this campaign? Personally I’m not too sure, what do you think? Clever of them to make the label just for the biggest pot size though to stimulate sales of a larger size. Who are the target market? Again, it’s not too clear to me, with the language of the letter seeming to be written for a younger (say 18-25 market) but I’m guessing one of their biggest buyers are generally the mums doing grocery shopping who would make the purchase decision. I ordered the label as I thought it was a neat idea and wanted to know more to write this blog post! I also thought it may be amusing as my two children (4 & 6) are learning to read and having Nutella is a real treat – having my name plastered on the jar might keep them out!